Huang, JG, Christian, JM, McDonald, GS and Chamorro-Posada, P 2008, Turing instability: a universal route to spontaneous fractal patterns , in: National Photonics Conference, Photon 08, 26-29 Aug, 2008, Heriot-Watt University, Edinburgh, UK. Turing instability is the tendency of the uniform states of a system to become spontaneously patterned in the presence of any small fluctuation . Archetypal Turing- instability patterns include hexagons, squares, stripes, and rings. These simple structures are universal in Nature, and characterized by a single dominant scale-length. Recently , we proposed that a multi-Turing instability may result in another type of universal pattern: fractals. Fractals possess proportional levels of detail spanning decades of scale-length, and are thus inherently scaleless. This prediction was confirmed in analysis of a classic photonic system (the diffusive Kerr slice with a single feedback mirror). The growth of such multi-scale patterns is entirely due to intrinsic nonlinear dynamics. They are thus physically distinct from fractal mode patterns of unstable-cavity lasers , and optical fractals that rely on system changes for introducing each scale-length . 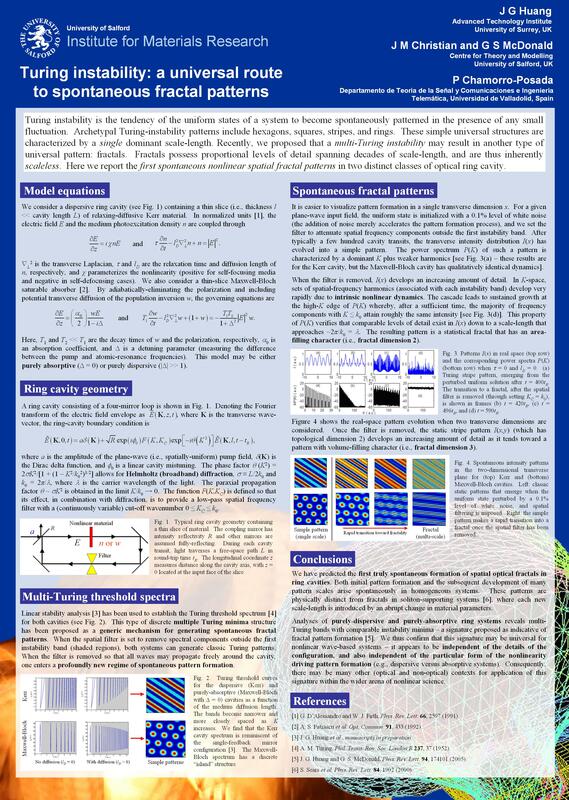 Here, we present the first predictions of spontaneous spatial fractal patterns in nonlinear ring cavities. This includes the first reported spatial fractals arising from purely-absorptive nonlinearity. New analyses reveal multi-Turing spectra characteristic of susceptibility for spontaneous fractals. Computer simulations consider both one and two transverse dimensions and quantify the fractal properties of the generated patterns. 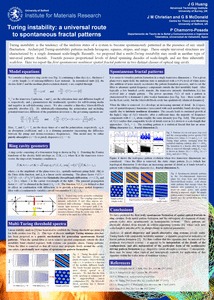 A range of results will be reported, including the proposal of a new kind of fractal soliton. References  A. M. Turing, Phil. Trans. Roy. Soc. London B 237, 37 (1952). J. G. Huang and G. S. McDonald, Phys. Rev. Lett. 94, 174101 (2005). G. P. Karman, G. S. McDonald, G. H. C. New and J. P. Woerdman, Nature 402, 138 (1999); J. G. Huang, J. M. Christian and G. S. McDonald, J. Opt. Soc. Am. A 23, 2768 (2006). S. Sears, M. Soljacic, M. Segev, D. Krylov and K. Bergman et al., Phys. Rev. Lett. 84, 1902 (2000).